Baconfat Log: Perry Plastics, Siege Junk, a Couple Zombies, and More! Perry Plastics, Siege Junk, a Couple Zombies, and More! I have a few pictures for you today. I should have more soon as I'm only showing you what I finished. There's quite a few more almost done. 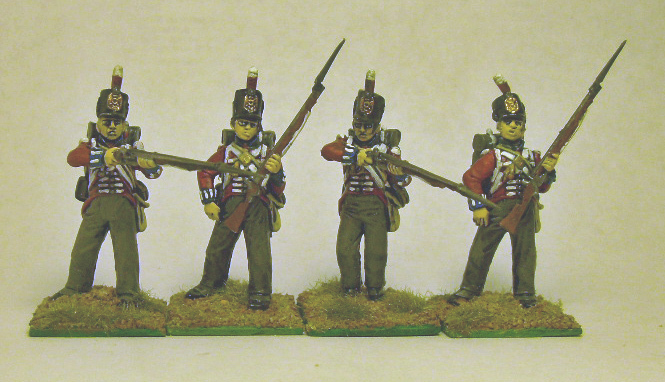 First are 4 more Peninsular British Line. 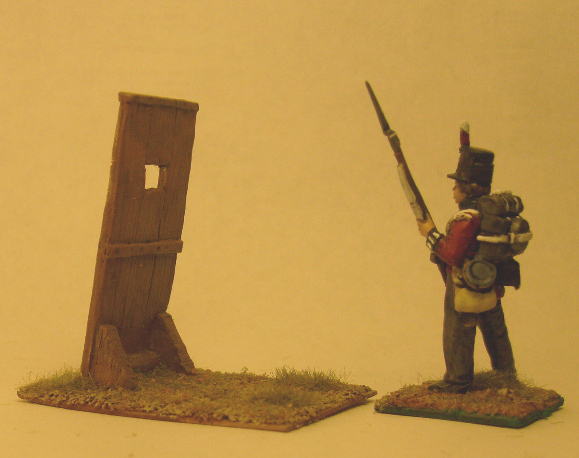 I painted them as the 6oth because they had both red coats and rifles in green. To my dismay I recently read that the all rifle units were in the peninsular. The only blue cuff units I could dig up I think are maybe the King's German Legion, the Swiss Roll-Dollins, and the French traitor unit (can't remember their name right now). Some of those had light blue and not my darker blue. I've painted the around 40 of them now and glued Peninsular heads on them, so they're going to the peninsula regardless. 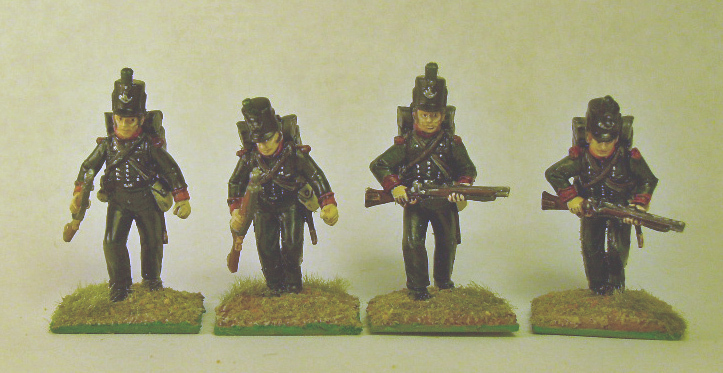 Secondly are four more 60th Rifles. I painted them using the dip method except for the skin which I tried the Dalimore method. Four shades of untalently laid flesh looks worse than my dipped or washed skinned faces I normally pump out. Here's a willy nilly pic I took to show anyone remotely concerned if they could mix Old Glory Nappies with Perrys. 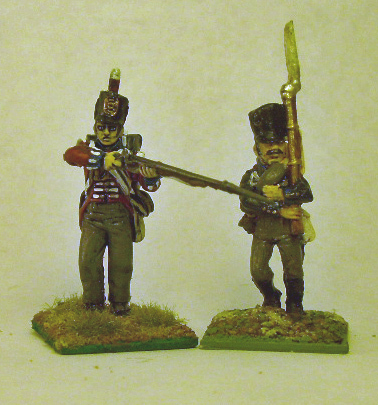 No, you can't, at least not in the same unit, unless the British models are taller than the Prussians. Here are three more zombies. Next post should include alot more zombies. Well the first one is a Reaper model and the other two are Blue Moon, which I buy from Old Glory 25's. 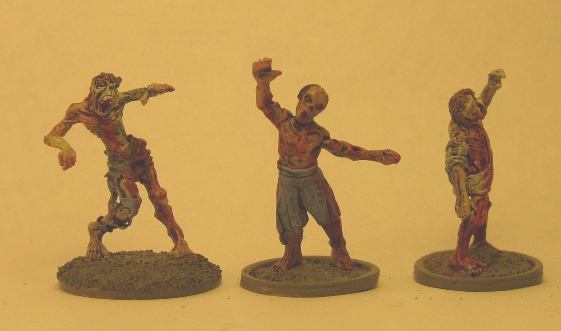 You may notice all my zombies have crap bases painted a boring gray. Well either I haven't come up with a good base scheme for my zombie horde or the walking dead simply don't deserve good basing. Before you mentally criticize the next model, realize it was one of the first models I painted around 25-30 years ago, as a kid. I haven't got much better, so feel free to criticize all the other shoddy work. 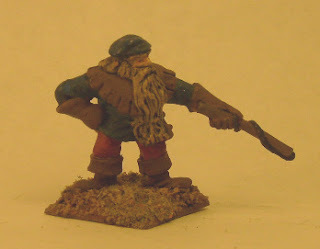 The Nick Lund sculpted (I think) Grenadier brand dwarf is one of the gunners for a giagantic bombard made out of enough lead to make sixty dwarves. Well, he's here because he was terribly chipped and needed rebasing. He might look worse now. Now that I am rambling about fantasy models, here are two more GW Empire artillery pieces I've finished. They're metal and oldish, I don't know what else to say. Here's a manlet I painted, I've now got about 20 of them painted now, for a giant siege battle I'm never going to run. The model is from Megaminiatures and the Perry model is there for scale. I said I was only showing you finished models but I wanted to show you a silly sneak peak of another UNFINISHED random project I'm working on. When I was young and played with 75-100mm plastic army men with kung fu grips, my favorite were the valiant forces of Cobra. 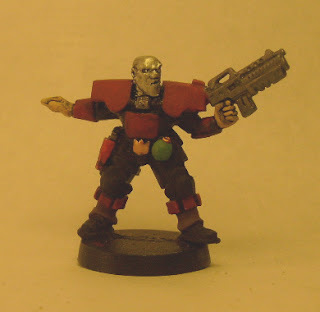 I did some scraping of a Target Games (out of business) model and started painting him like Destro. Destro, who for some reason has a metal mask that moves with his facial expressions. I imagine it's mercury based; I've always thought heavy metal poisoning was why the brave Cobra warriors never killed a single JOE. I'm also painting up some Cobra troopers which would be farther along but the primer I used doesn't hold paint that well and Target models aren't that fun to paint for me. Thanks for loving the cannon and sending that link. Between the link and other sources, I now believe my redcoats can stay 60th. The 60th Royal American Regiment of Foot wasn't initially all green suited rifles. I believe the 5th and 8th Btns were all rifles. The 6th and 7th Btns were regular troops with only their rifle companies in green. I believe the 1rst through 4th Btns were all wearing red with blue facing. The Military Subjects link you posted said 2cd Btn participated in the Peninsular action so I can stick with everyone being 60th. Being royal, they are authorized the blue facings. But my rifleman will have to be 5th Btn because I believe all the other rifles in the 60th had red edging and not fully red facing. According to "Darth" on a TMP post, everyone in the 60th regiment eventually switched to green uniforms between 1813 and 1816 when they were reclassified as light infantry. Some very nice stuff there.Good work. Thanks for visiting and the sweet pillow talk. I honestly do appreciate it. To be likened to a TMP sage is the very best compliment a toy army man aficionado can receive, especially from the very best painter in the Pacific Northwest.
" Well either I haven't come up with a good base scheme for my zombie horde or the walking dead simply don't deserve good basing." The walking dead lack vanity and care little about bases, so long as their path leads them to brains and plenty of them!! !